What is Sundae Split like? Sundae Split has often been compared to Sushi Go! as it is all about collecting the best group of food possible, but beyond that the games are pretty different. In the deck of cards, you’ll find bananas, cherries, 3 flavors of ice cream, sprinkles, whip cream and 3 varieties of vegetables. Each type of card scores differently, but the vegetables are definitely, most certainly and accurately negative points. I mean, who wants corn, broccoli or celery on their Sundae? If you just thought “I do” in your head, then stop reading now, because this game is probably not for you. Ok, you could still play it and enjoy it, but gross…seriously, gross. To begin the game, you randomly discard a number of cards based on the number of players, thus removing perfect information and levelling the field a bit. Then the starting player takes a number of cards (between 6 and 10 determined by the number of players) off of the top of the pile and splits them into as many piles as their are players with each pile having between 1 and 4 cards. Out of all of the cards, the starting player must place 2-4 cards (again, determined by the number of players) face down. All of the face down cards can be in different piles or in one pile, it is completely up to the starting player. Once all of the cards are in piles, the player to the left of the starting player chooses a pile and reveals the cards they chose. The round continues until every player has chosen a pile, the starting player being the last to choose. 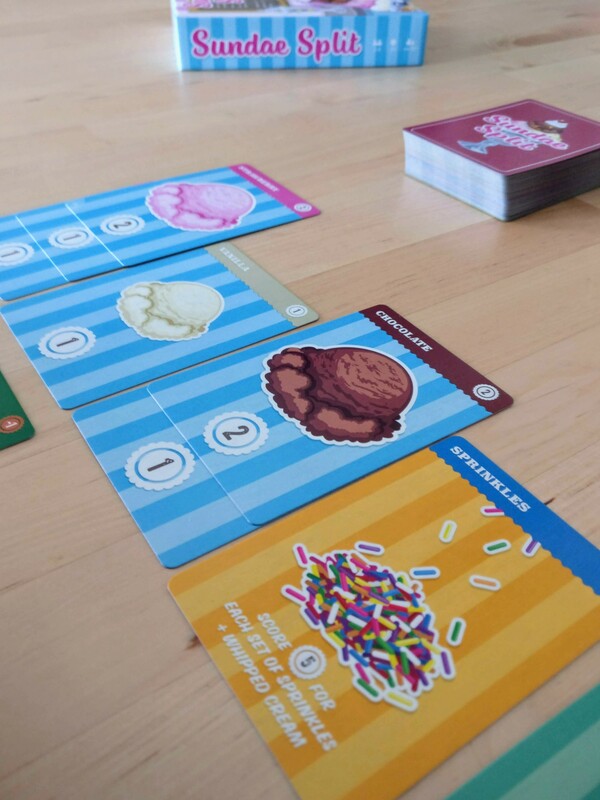 Play continues over several rounds until all of the cards have been played and then the player’s score their Sundae’s. There are 6 categories for scoring. Bananas score for the two players who have the most/second most. Cherries are multipliers for the flavor of ice cream of which the player has the most. Each individual scoop of ice cream has a value, but a bonus is given for each set of vanilla, chocolate, and strawberry that they have as well. 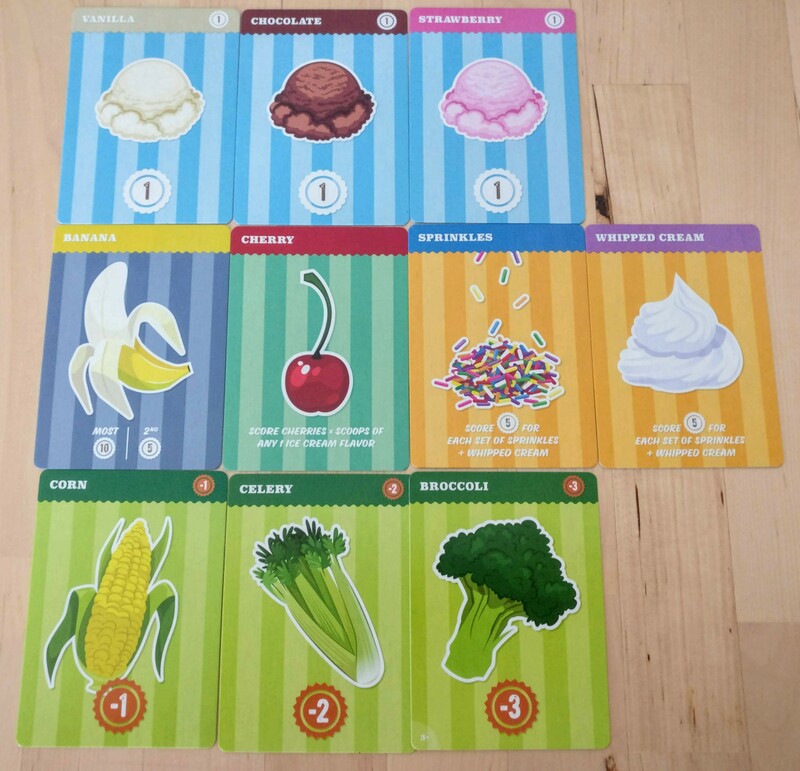 Sprinkles and whip cream only score for every pair that the player has and vegetables obviously provide negative points. I really enjoy this little game and for me, it replaces Sushi Go! The thing I like the most about this game is how simple it is to teach, but also, the surprisingly tough decisions that come in placing the cards into piles. The goal, as the starting player, is to trick the others into thinking you are hiding one thing, when really you are hiding something else. Maybe you make a pile of 3 face down cards full of vegetables, hoping someone thinks you are hiding good cards. Or maybe, you hide 3 good cards hoping they think they are vegetables. Or maybe you do a mix, or maybe you didn’t draw any vegetables at all or maybe…you get the point. Knowing what each player has, and therefore what benefits them the most allows you plenty of options on what to hide and not to hide. This can lead to some people overthinking the quick game that Sundae Split is, but in my experience, it never takes too long. Another really good thing about the game is the variety of ways to score. I love the different ways each type of cards score. I know this is the same in Sushi Go!, but for some reason, thematically, these make more sense to me. It makes sense that you want sprinkles with whip cream and a set of “Neopolitan,” or as the Danish call it, “Rainbow” (I mean strawberry ice cream wouldn’t be sold nearly as much without its companions of chocolate and vanilla). The banana and cherry scoring are a bit of a stretch thematically, but I like bananas and cherries, so I always want more of them. And don’t even get me started on the set-up cards. Honestly, they are one of my favorite parts of the game, because I don’t have to flip into the rule book for any rule, it’s all on the front and back of three cards. Why don’t more publishers do that? Thank you Foxtrot and Renegade for making my life a little easier! I’ll take this game anywhere and play with anyone, it’s a great little game! 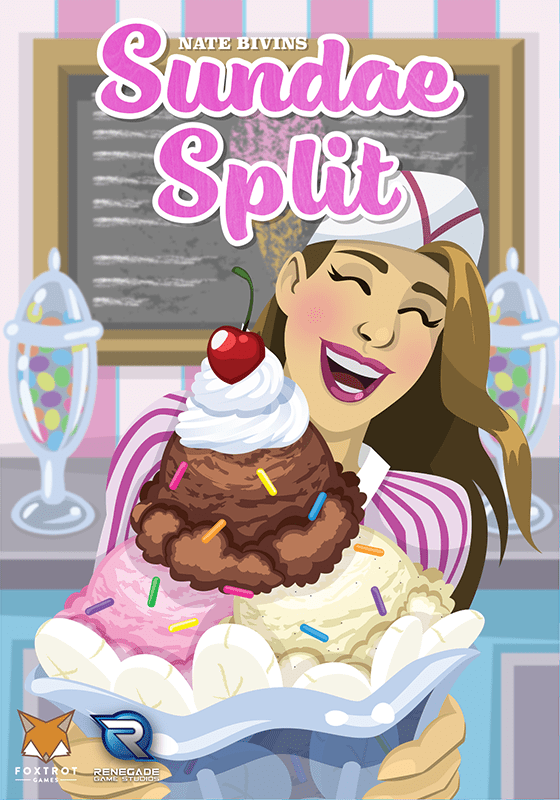 Sundae Split is a very easy game to learn and play. Even if the “deeper” levels of strategy escape someone, you can enjoy playing with them. The game is extremely easy to teach and after one mock round, everyone is ready to play more.